Do it Yourself, or DIY is an area that most people shy away from, preferring to call in an expert. On the other end of the scale, often over-enthusiastic DIY attempts can end in disaster – needing to call in someone to put right the damage and costing twice as much as if you’d asked someone else to do the jobs in the first place. You need to be prepared for things to fall down, fall off, break and need fixing though, so it pays to have a basic kit and a the ability to put right any little jobs that need doing around the home. What Do You Need In A Basic DIY Kit? 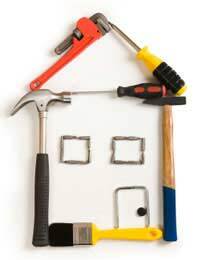 You can buy basic DIY tool kits at most DIY stores and they can often be picked up very cheaply. If you think you might get into the whole DIY and decorating thing and want to get in some more supplies just in case, you could also get a set of paint brushes, plus a paint roller and tray – some come with removable heads in different sizes too. You never know when emergency DIY is going to be needed, so it’s best to be prepared for all eventualities. Keep a spare torch by the fuse board/cupboard in your house, and keep a spare set of batteries close to it. You’ll really appreciate this when the lights go out and you can’t find anything in the dark! Keep little spares like the bleed key for the radiators, fuse wire and a set of pliers pliers in a dedicated drawer in the kitchen, so that if something blows or needs dealing with quickly, you don’t have to hunt for your tool box in the shed or garage. Keep a selection of fuses, hooks, and a roll of insulation tape in the drawer too, as you never know when you’re likely to need one – it’s invariably when the shops are shut. DIY is one of the most common causes of accidents around the home, so before you start anything, take precautions so that your efforts don’t cause any harm to anyone, or danger within the home. If in doubt whether you can fix or build something, read up about it first, and get all the right tools in advance. Don’t take on anything too adventurous if you’re not absolutely sure you can cope...and if you don’t think you can, there’s no shame in calling in an expert – that’s what they do! Make sure that anywhere you are working is kept well ventilated. Open all the doors and windows if you’re making a lot of dust or there are chemical fumes. Keep pets and children well away from where you’re working. Use the right tools for every DIY job, research thoroughly before you start and have everything ready. Make sure that you know how to use the tools – if you have hired something from a DIY store, ask for a demonstration so that you know what you are doing. Keep any tools well out of children’s reach. Be careful to follow any instructions.